The new DCSM metal roof vent sits on TOP of the standing seam rather than on the flat section of the panel. This makes more sense because it minimizes the potential for leaking. The rear counter-flashing of the vent tucks underneath the ridge vent, and over top of the rear flange of the vent. This vent is incorporated directly into our metal roof system and made from the same gauge metal and color as your main roof system. Available in all of the DCSM standard colors, so it will match your metal roof system perfectly. This metal roof vent can be used anywhere you would have a typical range vent, plumbing vent, dryer vent etc. We are excited about this new low profile, water shedding design. We are working on a new attic vent with the same design. Coming soon! This product has been tested, engineered, and designed for high wind areas. All DCSM products have FBC and/or HVHZ approvals and quality assurance. For more product information please contact our office. 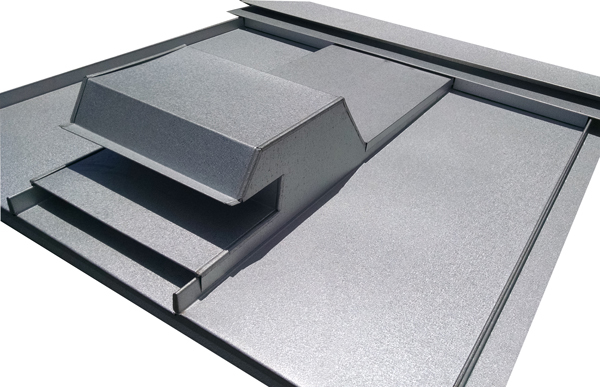 Application The DCSM Metal Roof Vent come in several different profiles specifically designed for each type of roof system. Materials Available in Galvalume*, aluminum or copper. Sizes Available widths are 12″, 16″ and 24″ to match the width of the panels.